With one of the highest concentrations of wind generating capacity in Europe--if not the world--the north German state of Schleswig-Holstein plans to double the amount of wind energy it generates from wind turbines on land. In the spring of 2010, the Conservative government approved a state energy policy that doubles the amount of land area devoted to wind energy. The policy also sets a state target of meeting 100% of its electricity consumption from renewable energy by 2020. Most of that will come from wind energy. Today Schleswig-Holstein meets more than 50% of its 12 TWh of electricity consumption with new renewables, mostly wind energy and on-farm biogas. Wind turbines currently occupy 0.75% of the state. The new law sets aside 1.5% of the state's land area for wind energy, or double the amount of land currently used. Like Germany's federal government, Schleswig-Holstein is ruled by a coalition of the conservative Christian Democratic Union (Christlich Demokratische Union Deutschlands), and the neoliberal Free Democratic Party (Freie Demokratische Partei). About the size of the US state of Connecticut, Schleswig-Holstein is the northernmost Land, or state, in Germany, bordering Denmark on the north and Hamburg and Niedersachsen (Lower Saxony) on the south. The state is one of the windiest in Germany, straddling the German portion of the Jutland peninsula between the windy North Sea on the west and the Baltic Sea on the East. Schleswig-Holstein punches well above its weight. The state's land area is only 4% of California's, but it generated 5 TWh in 2009 from wind energy-as much as the Golden State. Wind energy alone generates more electricity in Schleswig-Holstein than coal, oil, and natural gas combined (4.4 TWh). 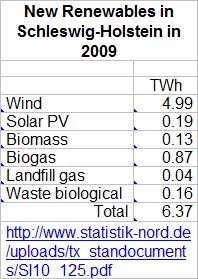 Only nuclear generates more electricity (12 TWh) in Schleswig-Holstein than wind. There is currently 3,000 MW of wind-generating capacity in Schleswig-Holstein, almost as much as in Denmark (3,500 MW). 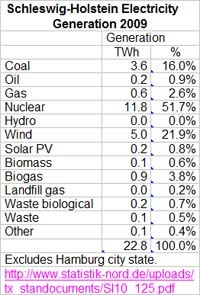 And, as in Denmark, most of the wind turbines, solar panels, and biogas plants in Schleswig-Holstein are locally owned. In the district of Nordfriesland--in the far northwestern corner of the state--more than 80% of the wind energy and practically all of the solar energy is owned by farmers and local investors. The conservative government has set ambitious targets. Within five years, the ruling conservatives expect wind generating capacity to increase from the current 3,000 MW to nearly 5,000 MW. Equally striking is the plan to nearly triple solar photovoltaics (PV) by 2015 from 540 MW in 2009 to 1,400 MW--as much as was installed in the US through 2009. On-farm biogas is no exception. Biogas generated nearly 1 TWh in 2009 from more than 300 plants. By 2015 Schleswig-Holstein expects to have 300 MW in operation from more than 600 plants. For comparison, a recent study found only 50 MW in operation in the US from 150 plants. The population of Schleswig-Holstein, 2.8 million, is less than 1% of that of the US, and about 10% of Canada's 35 million inhabitants. Schleswig-Holstein is a small state with a land area of only 16,000 square kilometers. It is less than half the land area of Denmark, and Denmark has been long regarded as having the highest concentration of wind generating capacity in the world. However, Schleswig-Holstein now has more than twice the wind-generating capacity per square kilometer as Denmark, more than any other German state, nearly eight times more than Iowa, and 32 times more than California, once the world leader in wind energy development. Yet few places compare to Nordfriesland, the wind energy capital of Germany. With its county seat of Husum--die graue Stadt am grauen Meer (the grey city on the grey sea)--and the surrounding countryside in northwest Schleswig-Holstein, Nordfriesland has one of the highest concentrations of wind generating capacity on record: more than 400 kW per square kilometer. And more than 80% of that is owned locally, either directly by farmers, or by local investors. In 2007 wind turbines owned by some 6,000 farmers and local investors--4% of the population--in Nordfriesland generated 1.3 TWh, more than California's famed San Gorgonio Pass, more than the Altamont Pass, and nearly as much as the Tehachapi Pass. Wind turbines in the Tehachapi Pass generated 1.6 TWh in 2005, the last year for which there are records. None of the wind turbines in the Tehachapi Pass are locally owned. Nordfriesland is only surpassed by the district bordering it on the south, Dithmarschen. In a press release describing wind energy as the "work horse" of the Schleswig-Holstein's economy, the state government reported that there were 718 MW of wind generating capacity operating in Dithmarshen in 2010. For a district slightly smaller than Nordfriesland, this is equivalent to more than 500 kW per square kilometer and 5.3 kW per capita. The pioneers of local ownership of wind energy in Germany can be found in Friedrich-Wilhelm-Lübke-Koog, a community in Nordfriesland near the Danish border. The settlers farming the polder on the northwest coast of Schleswig-Holstein have been agricultural innovators since taking the land from the North Sea in the early 1950s. The koog's 170 residents started a small revolution in the early 1990s that has spread across Germany. By developing wind and solar energy for their own benefit and the benefit of their community, the koog's inhabitants have served as a model for other stromrebellen (electricity rebels). And in doing so, they may have set a record for the most wind generating capacity in a specific land area. In 1990 residents saw the construction of their first wind farm with fifty 250 kW wind turbines manufactured nearby in the port city of Husum. The project was one of the largest of the day and all were owned by investors from outside the polder. The following year the koog's farmers decided to build a project themselves and organized the first Bürger or citizen-owned wind project. Through 1999, residents installed 32 turbines of their own. In 2009 the old wind turbines were removed and new ones installed. The "repowering" reduced the number of turbines dramatically and increase capacity more than three-fold. Now all 30 turbines operating in the polder are owned by the local citizens. The 47.5 MW of the koog's modern wind generating capacity is owned by 170 shareholders. The koog contains 25 active farms and one pub--an essential element of any German settlement--within its 14 square kilometer (3,000 acre) boundaries. The community-owned repowering resulted in a density of wind generating capacity on the landscape unlike that possibly anywhere else in the world: 3,500 kW per square kilometer. Despite the koog's high concentration of wind turbines--or maybe because of it-- the polder and its community have become a model for wind development elsewhere. Some residents, such as Hans-Detlef Feddersen, have become outspoken proponents of community renewable energy development and community ownership of wind turbines and solar PV systems. With the advent of 2004 revisions to Germany's system of feed-in tariffs--and falling solar PV prices--the koog's residents have now also turned to solar-and the polder is just about as far north as one can go and still be in Germany. Today nearly every farm building in the polder is covered with solar PV systems, so many in fact that the koog won top prize in a national competition for the highest concentration of solar energy per capita in 2010. It wouldn't surprise anyone in the renewable energy industry if the polder's citizens were nominated for the European Solar Prize some day-and won. Ultimately, Schleswig-Holstein expects more than 9,000 MW of wind capacity--two-thirds of that on land--will be installed in the state by 2020. These wind turbines will generate about 28 TWh per year. 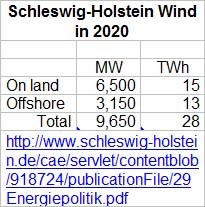 By 2020, more than 100% of the electricity consumed in Schleswig-Holstein will be produced by wind energy alone. That's five times current generation from existing wind turbines. Schleswig-Holstein is currently a net exporter of electricity. It generates more than twice its internal consumption, mostly from renewables and nuclear power. By 2020 wind alone will replace the state's aging reactors, all now slated for closure. How much of this new renewable generation will be owned locally is unknown. Offshore wind is the sole domain of the multinationals. The only proposed community-owned offshore project, the pioneering 240 MW Butendiek (outside the dike), was formally cancelled in 2010 after years of painstaking work. On land, there remains a strong preference for local ownership of renewable energy development-and even transmission. There is a serious proposal for a development, construction, and ownership of a new transmission line linking portions of Schleswig-Holstein with a 35 kilometer buried transmission line. Recently, the concept of community ownership of transmission has received high level backing from Germany's conservative government. According to the federal government's parliamentary secretary for the Ministry of Environment, Katherina Reiche, developing a citizen-owned transmission line may be a way to more quickly build the needed transmission capacity. Reiche, a member of Chancellor Angela Mekel's cabinet, made the comment at a meeting between the conservative government and proponents of the transmission project. Further development of renewable energy and building of the transmission network is two sides of the same coin said Reiche. "We need a new transmission network to get decentralized generation from renewables to consumers." Critics note that in Germany it is the responsibility of the utilities to build transmission lines. The utilities have long known of the need for increased transmission capacity to handle renewable energy, and yet they have continued to dawdle. Community groups, say critics, are taking action only because the utilities have failed to act in a timely and responsible manner. In either case, the utilities and their customers will have to pay for the new transmission line, whether community-developed or otherwise. While many North Americans find it hard to imagine developing and owning a renewable energy system other than a few rooftop solar panels, Germans take it in stride. They don't see what the fuss is all about. As Nike would advise, they just do it. For example, the majority of German renewable energy is in the hands of the people says a German government web site. 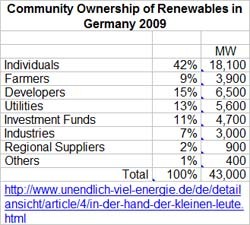 More than 51% of the 43,000 MW of renewable energy capacity operating in Germany at the end of 2009 was owned by farmers or small private investors. Many of the private investors, or citizen-owners of renewables, live in the communities or in the regions where the wind turbines, solar systems, and biogas plants are located. In Germany, farmers and private individuals are responsible for developing a staggering 22,000 MW of renewable capacity, the equivalent of at least $50 billion in private investment. In the US, there was 35,000 MW of wind-generating capacity installed at the end of 2009, less than 1%, some 300 MW in Minnesota, was locally owned. The situation is similar in other English-speaking countries. The German model of paying for renewable energy with a system of feed-in tariffs enables everyone to develop the renewable energy technology that is best suited for them. This could be as simple as installing a solar PV system on their rooftop, or building a biogas plant on their farm, or investing in one or more wind turbines in their community. The success of this strategy now transcends political party boundaries and ideologies, as evidenced in Schleswig-Holstein. It is not just the Greens (Bündnis 90/Die Grünen) or the Social Democrats (Sozialdemokratische Partei Deutschlands) that support more renewable energy. As seen in Schleswig-Holstein, the conservative CDU and their conservative coalition partners the Free Democrats want to not only double the amount of wind energy in the German state that already has one of the highest concentrations of wind turbines in the world, but they also want 100% of the state's electricity consumption to come from renewable energy in less than a decade.